April 21st brings the day we will see Google’s mobile friendly algo goes live to all mobile searchers. Here is everything you could possibly need to know about the mobile algo, including the most common questions as well as some of the more obscure things that do or do not have an impact on the algo. We will also continue to update this as we learn more if/when the algo gets updated in the future. Gary Illyes has said that the mobile algo will only be affecting the core “ten blue links” – namely the ten organic search results that are not a part of any other section, such as “In the News” etc. That said, teams for the other of those other sections could always incorporate their own mobile friendly signal into their own algorithm. This is one thing many webmasters are surprised to learn. Searches done for tablets are not being affected by this algo. It is strictly for smart phones. That said, many mobile friendly designs, particularly responsive design, will deliver a great user experience. But this algo does not impact search results done on tablets. Along with the “ten blue links” thing, “local packs” are not affected by this mobile friendly algo at all. However local businesses that are showing up as part of the organic “ten blue links” results will be impacted. And yes, Google My Business could use their own mobile friendly signal, and many local experts feel they are already incorporating some sort of boost to mobile friendly local sites into their mobile results currently. So if you are a local business, even though this specific algo doesn’t impact them in the local pack results, making a mobile friendly site should be a priority. Again, the “ten blue links” means that Google News results are not impacted, including results appearing specifically in Google News, as well as those appearing as part of “In the News” in the regular search results. This mobile friendly ranking algo doesn’t affect just English results, it is affecting all languages of Google Search. When Google made the initial announcement, they also included it on all their non-English Google Webmaster blogs so that all webmasters would be aware. Yes, brands will still continue to rank for their brand names, simply because their brand power is so strong. So yes, they will be demoted for not being mobile friendly, but you shouldn’t see a competitor showing up for a company’s brand name. That said, if a company is penalized in the index through one of the other Google algorithms, such as Penguin or Panda, it could certainly affect how they are showing up in the search results. So it’s not something where I’d say there is no effect at all on branded queries because they’re somehow magically different. It’s just that these sites are often very, very relevant for these queries and even if they’re slightly demoted then it is not going to drop them from page one or drop them, sometimes like not even from the first position. This would also be a case where having a strong social media presence will really pay off, since it is likely that even if the brand’s presence isn’t strong enough to take the top spot with the mobile-friendly change, the social media sites should hopefully take the place. There has been a lot of talk about app interstitials and if they would receive a demotion in the mobile-friendliness test. But it is not currently a part of the algo. There is also the issue that Googlebot could see this as cloaking, according to Google. Users generally want to get right to the content and don’t like interstitials, so it’s a good idea to send users to the right content for their device. If you have an intermediate page, make sure you don’t treat Googlebot any differently than you would treat a regular user. If users see something, Google should see it too, otherwise that could be considered to be cloaking. It’s also a good practice to add a “take me to the desktop site” link at the bottom of your site, in case mobile users want the desktop interface. If you have an app, avoid the common mistake of an app download interstitial: https://developers.google.com/webmasters/mobile-sites/mobile-seo/common-mistakes/app-download-interstitials and also check out our app indexing documentation: https://developers.google.com/app-indexing/. That said, sites would probably want to rethink this strategy, as Gary Illyes has hinted that this change could be coming. This is probably the largest misconception people have about how this algo works. Google will show a webpage in the mobile search results as mobile friendly only if that individual page passes the mobile friendly test. It does not assign an entire site the mobile friendly status if a certain percentage of the site is deemed mobile friendly. In other words, the mobile friendly tag is applied on a page by page basis. So once again, a page will only get the mobile ranking boost if that particular page is mobile-friendly. There is also a section within Google Webmaster Tools with specifics on blocked resources. If it is a third-party resource, it shouldn’t be an issue since the webmaster generally does not have control over those resources. If you leave it to the last minute, or you are fixing pages after the algo goes live, you can force Googlebot to visit so they can get the mobile friendly boost right away, and not have to wait for Googlebot to eventually stop by. This is also handy for static pages that don’t change often, so you aren’t stuck waiting forever for the Googlebot visit. Here are three ways you can force Googlebot to reindex pages. Unless you are designing for feature phones, there is no need to submit a new mobile sitemap. Surprisingly, page speed is not included in the mobile friendly ranking algo. So you can first focus on getting your site mobile friendly and then worry about getting the site speed down, if you are pressed for time. That said, it sounds very likely it will be added into the algo in the future, from this hint dropped on Twitter by Gary Illyes. Bottom line, when it comes to page speed, while it isn’t specifically included in the algo at launch, it will be making an appearance at some point. While there is a minor ranking boost for HTTPS sites, there is nothing built into the mobile friendly algo that would give an additional boost if a site is secure. But with both Chrome and Firefox making their own changes, it makes sense for webmasters to consider making their sites secure, if they haven’t already. Just how the mobile friendly algo is applied on the fly when Googlebot crawls your page, if you make changes to a webpage that makes it not be mobile friendly anymore, the page will lose the associated ranking boost and the mobile-friendly tag. If you have recently converted your pages to being mobile friendly, make sure you have a backup of the site from after the changes were made, so if something happens to the server, the backup will still have the mobile friendly version of the pages. Some WordPress plugins and themes are not mobile-friendly, despite assurances they are. Anytime you update a plugin or a WordPress theme, always go and double check and ensure your site is still passing the mobile friendly test. You don’t want to wait until you notice the mobile errors popping up in Google Webmaster Tools. Likewise, be careful of some plugins that can accidentally block Googlebot, which of course would not only cause it to lose it’s mobile-friendly boost, but lead to those pages being removed from Google. As mobile searches continue to increase, we could eventually see a change, since title and description lengths are different on mobile and desktop. But as of now, they will be the same. It is advisable that webmasters who are utilizing m.example.com mobile sites that they add the m. to Google Webmaster Tools so they can be aware of any changes or problems. It can be helpful to isolate issues if you add parts of your site separately—it’s up to you. If your main desktop site is a subdomain (like www. ), then it’s a good idea to add the mobile subdomain as well so you can get data for that part of your site. If you have separate URLs for desktop and mobile, ensure that you are correctly matching them for Google so there will not be any potential ranking issues, such as the pages not ranking as well or being hit with the duplicate content filter. You can match them up either by using a rel=”alternate” tag on the desktop URL with a rel=”canonical” tag on the equivalent mobile URL, or you can match them up in your sitemap. Google is also working on a separate Google mobile only index, according to Gary Illyes at SMX West. It is definitely an intriguing idea, and will definitely have huge implications for SEO where suddenly SEOs will have to consider having two versions of the site so they can optimize on for mobile and one for desktop search. Whether we will see something like this actually go live remains to be seen, but it is pretty interesting that Google is considering this. 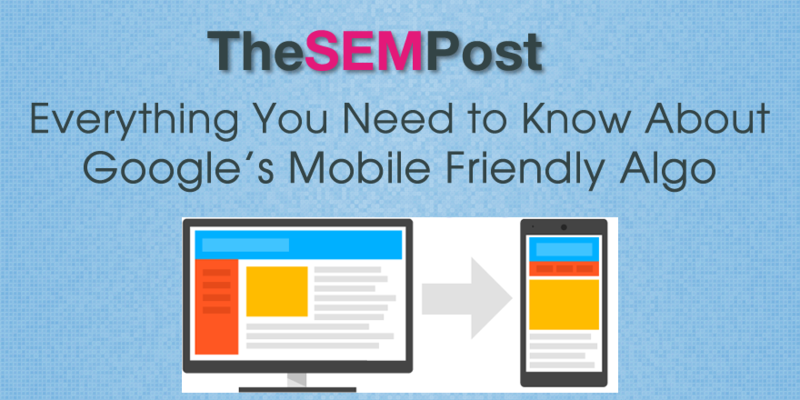 Don’t just check the homepage and decide the entire site must be mobile friendly. It isn’t uncommon for a homepage to pass the mobile friendly test with flying colors while internal pages are not – especially for WordPress sites. If you don’t want to test each site individually that it passes the test and the tag shows up in the search results, at the very least check your top 10 or 20 traffic pages, so that if something goes awry for internal pages, you can see it on the pages that will have the largest impact. While Google recommends responsive design for making websites mobile friendly, they have said multiple times that responsive does not give any kind of extra boost if a site is responsive over other types of mobile sites (dynamic serving and separate URLs). Good news for those of you who hate the waiting game of Panda and Penguin, the mobile algo is continuously updating. It also means any changes they make in the future could also be corrected on the fly and ranked accordingly. While they haven’t explicitly come out and said it, everything points to this algo changing and updating over time, especially with some of the hints dropped. So while it is fairly straight forward right now, it will be tweaked in the future. If you are concerned with how Google will handle links split across two versions of a page, with some pointing to the desktop version while others point to the mobile version of the same page, Google is connecting the dots for links and PageRank. The way to think about it is that if there are two URLs representing the same piece of content (say, desktop and mobile), we’ll try to think of those two URLs as a single document in ranking, so links to either URL will count as a link to the combined document. So if the mobile version has 2 links and the desktop version has 3 links, we have a document with 5 links. When a user searches, we’ll rank that document as having 5 links, and then choose the correct URL to represent that document in search results based on whatever device the user is using. When converting desktop pages into mobile ones, there are many times when the sheer amount of content can overwhelm a user. But there are also potential SEO implications for hiding content that need to be taken into consideration. As long as the content you are hiding for the mobile user also appears on the equivalent desktop page, and they are properly linked together, there should not be any issues with being penalized by Google for hidden content. While this might seem obvious, some scammy SEO companies are marketing on the mobile friendly algo and spamming website owners, telling them their sites will be removed from Google if they don’t make their site’s mobile friendly immediately. So, no, Google won’t remove you from the index, it is just giving a boost in the mobile search results to the sites that are. Will Another Google Algo Roll Out at the Same Time? However, the mobile friendly algo along with both Panda and Penguin…. well, those would be fun times! Google says they expect the rollout to last about a week, starting on April 21st. We’re expecting to roll out on April 21st. We don’t have like a set time period because its going to take a few days to roll out, like maybe a week or so. Whether it rolls out across users or rolls out across sites remains to be seen, but it should be fairly obvious once it does start. Google has said this mobile friendly algo “will have a bigger impact on the search results than Penguin and Panda did.” This news isn’t all that surprising, because Panda and Penguin only affected a small percentage of the websites in Google’s search results. But it does show just how big the impact will be, because essentially every single webpage will be labeled as either mobile friendly or not. While we have been seeing hints that Google was working towards a mobile friendly signal of some variety for over a year as they pushed to encourage webmasters to make their sites mobile friendly, we now know that the algo was a year in the making. Again, with that much time spent into it, it makes sense it will continue to be updated.